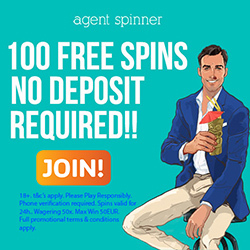 1) Who was the first NetEnt casino to give REAL CASH free spins (also known as free spins without any wagering requirements) AND STILL continues to give free spins without any wagering requirements? 2) Who was the first NetEnt casino to break all the record payment processing records by being able to make payments to players instantly via E-wallets, and in less than 2 hours to credit/debit cards and bank transfers? Guts Casino delivers the best industry games from top online gaming software leaders, such as Betsoft, IGT, Microgaming, Net Entertainment and Leander Gaming. To top all of this, you can be assured that when you play at Guts, safety, security, and payback are not an issue. Guts Casino has an excellent Welcome bonus deal which offers all new players a €300 Welcome Package. First Deposit Welcome Bonus: get 100% up to $/£/€100 and 50 NetEnt free spins on Starburst slot when you make your first deposit. Second Deposit Welcome Bonus: get 50% up to $/£/€100 when you make your second deposit at Guts. Third Deposit Welcome Bonus: get 50% up to $/£/€100 when you make your third deposit at Guts and get an additional 50 free spins on Starburst slot. If you are looking for more bonuses, then take advantage of More Money Mondays! Every Monday beat the Monday Blues with a 40% bonus up to $/£/€100 plus 15 REAL CASH Free Spins on the slot of the week. If that doesn’t tantalize you enough, then enjoy NetEnt Free Spins Thursdays! 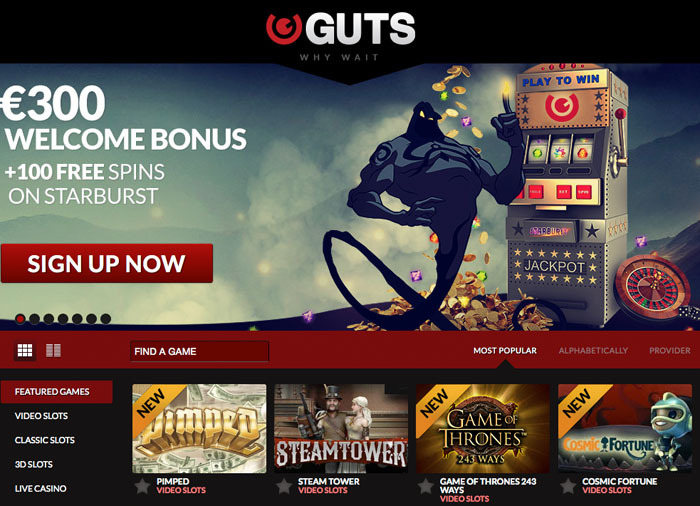 Once you are a registered player at Guts, you will get No Deposit free spins each week on online slot games such as Jack Hammer 2, Gonzo’s Quest, Jack and the Beanstalk or Starburst. Players are only allowed to sign up for one account per person, household, or IP address. There are NO wagering requirements for free spins. There is also NO maximum cashout rule at Guts Casino. So if you won €2000 from playing with your Starburst free spins, you will be able to withdraw this money immediately without meeting any wagering requirements. All free spins from the Free Spins Friday offer are available after 11h00 CET the very next day. Players from the following countries are restricted from playing at Guts Casino: United States of America, Germany, Ethiopia, Iran, Hong Kong, France, Syria, Nigeria, Belgium, Spain, Italy, Denmark, Afghanistan, Kuwait, Iraq, Jordan, Turkey, Pakistan, and Yemen. Players from the following countries are NOT permitted to receive the first deposit bonus and or any deposit bonuses unless otherwise stated: Poland, India, Pakistan, Indonesia, Romania, Russia, Czech Republic, Portugal, Slovakia, Croatia, Ukraine, Bulgaria, Greece, Hungary, and Latvia. There are game-specific wagering requirements, such as: all classic slots contribute 70% towards your wagering requirements, table games contribute 0% and slots and other games contribute 100% of the wagering requirements. The wagering requirements on bonus money given is 35 times. You may choose to make a deposit using the following options: Skrill, Visa, Neteller, Glupay, Paysafecard, Ukash, ECO, Mastercard, Webmoney (by moneta), Euteller, or Bank Transfer. Bank transfers and Visa credit cards take 1 – 2 days working days to cash out, while online e-Wallets such as Neteller, Skrill, and Webmoney allow you to withdraw your money instantly. You can play at Guts using the following currencies: US Dollars, Euros, Pound Sterling, and Swedish Krona. Guts Casino offers very good customer support to all its customers. Speak to a support technician via Live Chat or contact them by email. ← Elios Poker Casino Review | €10 Free (no wagering requirements).